The Commercial of Ceylon has been adjudged the ‘Most Innovative Customer Service Banking Brand, Sri Lanka 2018’ by the UK-based ‘Global Brands’ – a magazine that provides reviews, opinions, news and polls on leading brands across the globe. Commercial Bank was evaluated alongside more than 7,000 other companies in a study conducted by an independent external research agency appointed by the Global Brands and was chosen as the recipient of this award from Sri Lanka. The agency collected data from publicly available sources and submitted its nominations in the award categories to Global Brands Publications Limited. The Bank received this award at a ceremony at the Banyan Tree Macau. Commercial Bank’s Deputy General Manager Marketing Mr Hasrath Munasinghe accepted the award on behalf of the Bank. The Global Brands Awards programme was established with the aim of honouring excellence in performance and rewarding companies across different sectors. The awards recognise companies that have performed extraordinarily well in the fields of Finance, Education, Hospitality, Lifestyle, Automobiles and Technology. 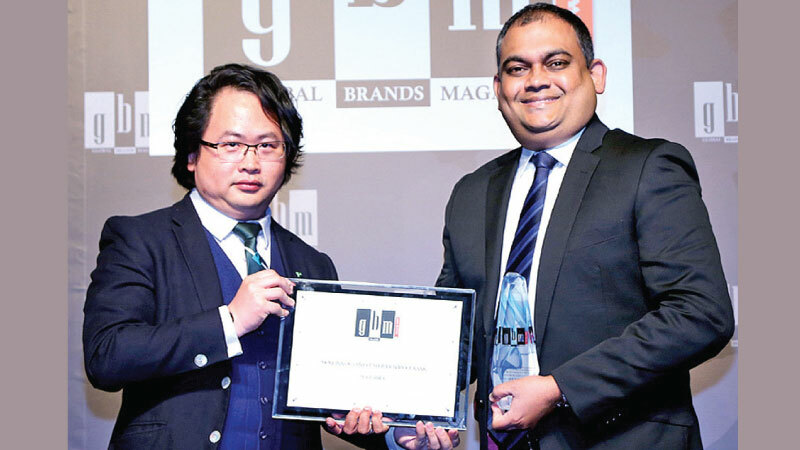 Commercial Bank Deputy General Manager Marketing Mr Hasrath Munasinghe (right) receives the award presented by ‘Global Brands’ in Macau.